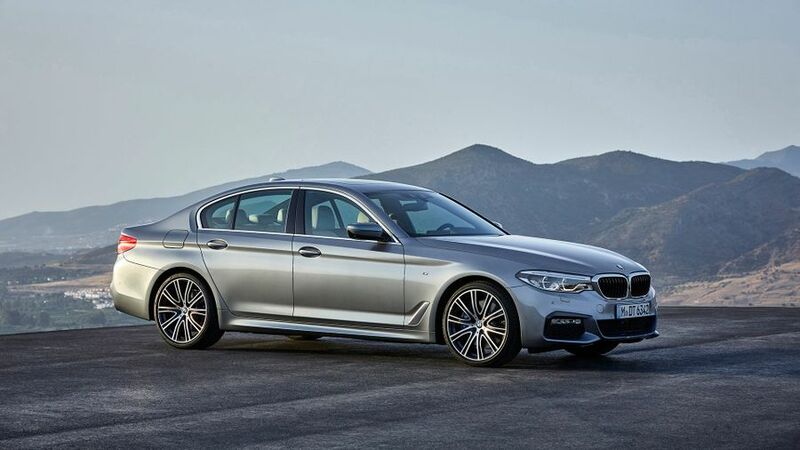 These are the first pictures of the new BMW 5 Series saloon, which was unveiled today. The seventh generation of the model will be seen in the flesh for the first time at January’s Detroit Motor Show. BMW says that compared to the previous model, the new car is lighter, safer and more fuel-efficient, as well as featuring bags of new technology. It’s also a little larger – 36mm longer and 6mm wider – and although the lines are a little softer than those of the larger 7 Series, the new 5’s looks are unmistakeably BMW. The twin circular headlights (LED units as standard across the range) frame the familiar kidney grille, and there’s a sense of sportiness when you look at the car from the side. Alloy wheels – at least 17 inches – are standard across the range, while all models also have symmetrically arranged exhaust pipes, and M Sport models sit a little lower on their sports suspension. In spite of the sleek styling, BMW says the new car is more spacious than the old one, especially in the rear, where there is considerably more headroom. Likewise, not only is the 530-litre boot larger than its predecessor’s, it has a lower sill, intended to make it easier to load and unload bulky items. In terms of design, the cabin is very like that of the larger 7 Series, and it will have many of the same features. Dual-zone climate control will be standard across the range, and the control system centres around the 10.25-inch touchscreen. Gesture Control – which allows the driver to control things using hand movements without touching anything – is available as an option. Also to be found on the options list are a 16-speaker Bowers and Wilkins stereo, a four-zone climate control system and a rear-seat entertainment package. The engines are all turbocharged, and each one is both more powerful and more efficient than the equivalent unit in the outgoing range. In the initial line-up, the lowest emissions – 108g/km – come in the 520d, which averages almost 70mpg in the official tests. 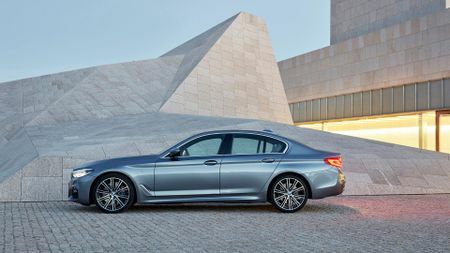 As well as this engine, buyers can also choose from the petrol-powered 530i and 540i, and the 530d diesel. All but the base petrol engine can also be paired with BMW’s xDrive four-wheel drive system. Shortly after these models appear, BMW will extend the range with two more economy-focused models. The 520d SE Efficient Dynamics has vital statistics of 102g/km and 72.4mpg, while the plug-in hybrid 530e – which will be launched in March – has CO2 emissions of just 49g/km and a range of 28 miles on electric power. Such gains in efficiency are partly down to the car’s lighter weight – up to 100kg per model – and that also improves how the car behaves on the road, says the company. Not only does the car combine sporty handling and a comfortable ride, it’s also available with the very latest in driver-assistance systems. Among these are Adaptive Drive (which combines Dynamic Damper Control with an anti-roll system), adaptive cruise control, and the Driving Assistant Plus package, which combines the Lane Keeping Assist and Lane Departure Warning systems. 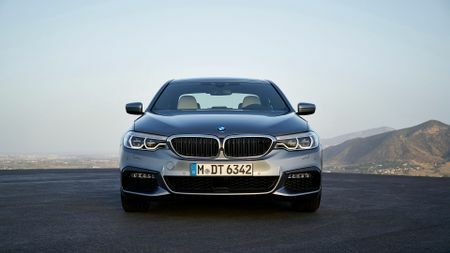 Technology, too, is another area BMW is proud of with the new car, and again the 5 will be available with lots of equipment first seen on the 7 Series. This includes the Remote Control Parking, Surround View and Remote 3D View systems, while Apple CarPlay is also available; and, in a first, the driver’s iPhone can be integrated without the need for any cables. 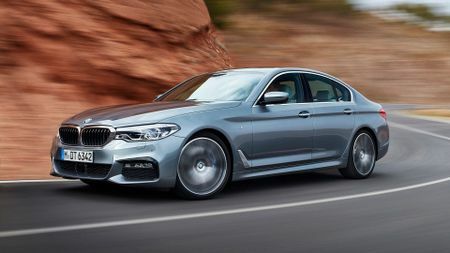 As well as that, BMW is also the first manufacturer to provide users of Microsoft Office 365 with a secure server connection for exchanging emails, calendar entries and contact details through the built-in Microsoft Exchange function. The same system also allows addresses from appointments to be entered straight into the sat-nav system, and phone numbers can be dialled directly from a linked phone. For now, only the 5 Series saloon has been unveiled, but we expect the Touring estate to follow in due course, probably early in 2017. This saloon will rival the likes of the Audi A6, Jaguar XF and Mercedes E-Class, and it goes on sale later this month, with prices starting from £36,025. First deliveries are expected in February next year.